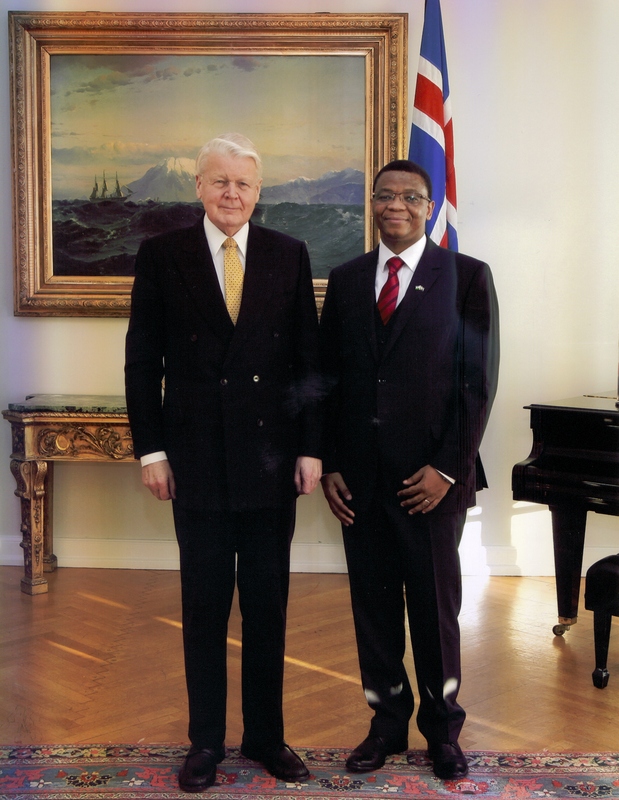 On the 05 February, 2013, His Excellency Mr. Paramente Phamotse presented to H.E Mr. Ólafur Ragnar Grímsson, President of Iceland, the letters of credence accrediting him as the Ambassador Extraordinary and Plenipotentiary of the Kingdom of Lesotho to Iceland with residence in Dublin, Ireland. On this occasion marking the presentation of credentials, the Ambassador also had the opportunity to discuss with the Icelandic Government officials the possible areas in which Lesotho and Iceland could cooperate in the future. The Ambassador was accompanied by his spouse Mrs. Moipone Phamotse and the First Secretary Mr. Nkhotha Machachamise. In a quest to promote trade and investment between Lesotho and the countries of accreditation, the Embassy recently participated in the Norwegian-African Business Summit in Oslo on the 12th October, 2012. This was the second time that this Business Summit was held which aims to draw the attention of the Norwegian businesses to invest in African countries including Lesotho. The summit was graced with the presence of the Minister of Foreign Affairs of Norway who amongst other recognized the potential and progress of African economies. Many African Envoys also attended this summit. The Embassy had the opportunity to exhibit the vast investment opportunities in Lesotho and established networks with a number of captains of industries in Norway. The Embassy also participated at International Trade & Embassy Conference & Exhibition in Limerick, Ireland on the 4th October, 2012. 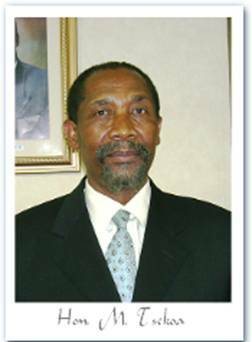 In this event, the Ambassador of Lesotho to Ireland, H.E. 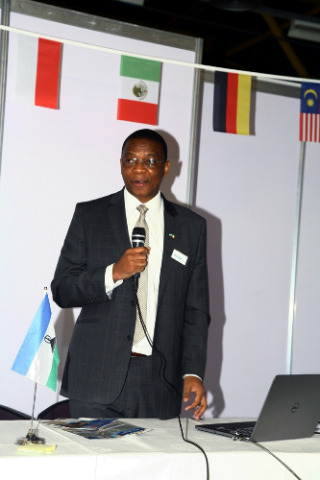 Mr. Paramente Phamotse made an appeal to Irish investors to consider Lesotho as their next investment destination. 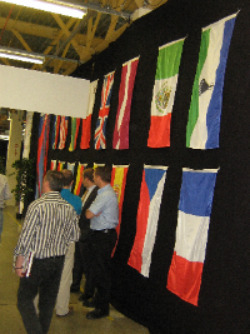 Above Left: National Flags of the countries which participated in the International Trade & Embassy Conference & Exhibition in Limerick. Above Right: H.E. Mr. Phamotse presenting the trade opportunities in Lesotho at the Conference. 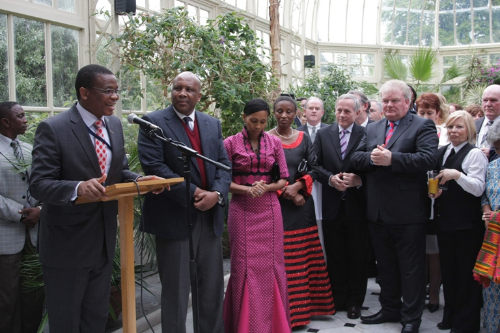 Lastly, the Embassy participated in the 2nd African-Ireland Economic Forum in Dublin on the 22 October, 2012. The Forum was among others addressed by the Tánaiste and Minister for Foreign Affairs and Trade Mr. Eamon Gilmore TD. who emphasized the Government’s commitment to revitalize trade links between Ireland and Africa, the fastest growing market in the world. 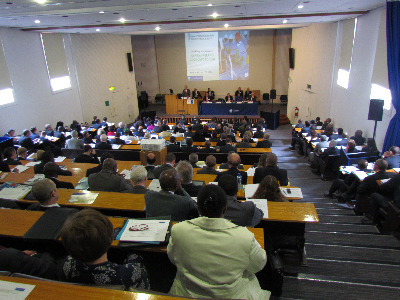 The event attracted approximately 140 participants from Africa and the Irish business community. 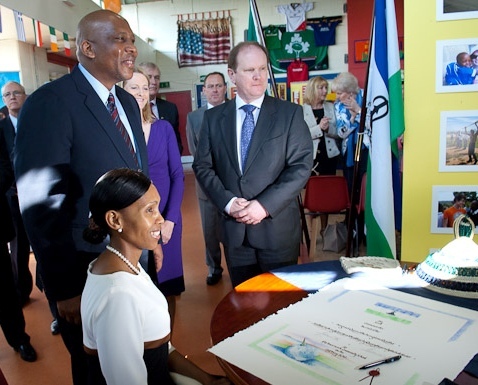 His Majesty King Letsie III and Her Majesty Queen Masenate Mohato Seeiso departed Ireland on Tuesday morning last week after a short visit in the country which started on the 20th May, 2012. 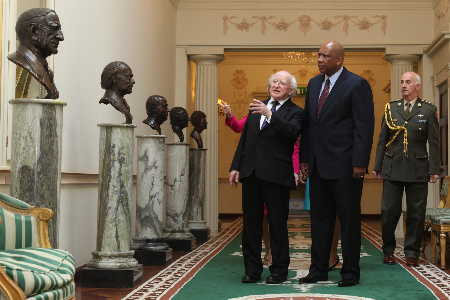 During this historic visit, their Majesties had audience with President Michael Higgins and his wife, Mrs. Sabina Higgins at Áras an Uachtaráinas as well as with Government Ministers and officials. 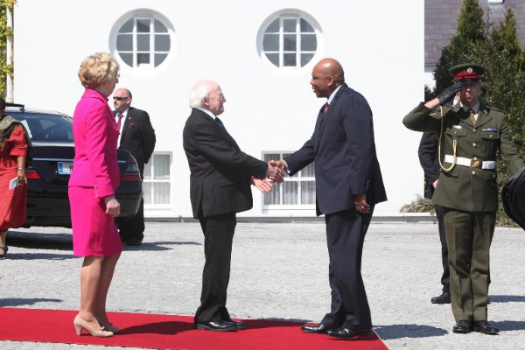 His Majestry is greeted by President Higgins and his wife, Mrs Sabina Higgins. Apart from meeting Government officials, their Majesties had the opportunity to visit Coolmore Stud, Newbridge Silverware, Country Crest, Portmarnock Community School, Eirgrid, St. Michael’s House Special School and the Guinness Storehouse. They also had the opportunity to meet Basotho and Friends of Lesotho resident in Ireland during a reception that was organised by the Embassy in honour of this visit. This long awaited visit has cemented the long standing relations that have always existed between the Kingdom of Lesotho and Ireland which date as far back as the 1970s. During lunch with His Majesty’s delegation, President Higgins stated that “the relationship between Ireland and Lesotho has evolved through many phases. In the past, the missionary connection was extensive…Ireland's official development cooperation programme in Lesotho was our first official programme of assistance and it began in 1975. Its genesis was a meeting of our then Minister for Foreign Affairs, Garret FitzGerald, who later became Prime Minister, and his counterpart from Lesotho”. 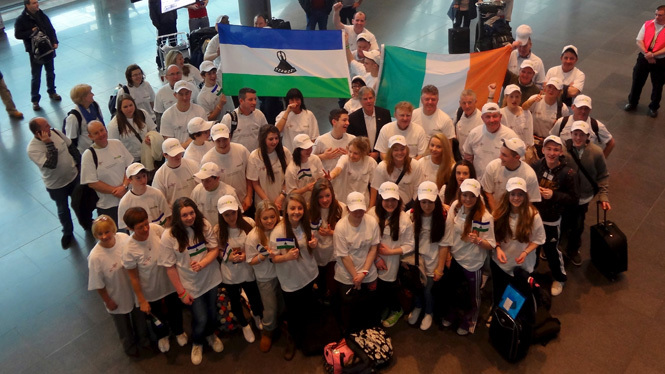 The Embassy has facilitated a 60 member Irish delegation to Lesotho. The purpose of the trip is to implement a five-year integrated development programme in the country starting this year after completing the same programme in South Africa last year. The delegation before boarding a plane to Lesotho at Dublin Airport. The team left for Lesotho on February 11th and is expected to complete this phase of the project on February 24th, 2012. The delegation comprises businessmen, nurses, teachers, community members mostly from the Fingal County and more importantly Portmarnock Community School students and their parents. Among the components of this programme that will be implemented during this visit will be the twinning of PCS with Hlalele Secondary School in Maseru. This will entail among others, capacity building for teachers in ICTs and Lifeskills which will be undertaken in collaboration with the Lesotho College of Education. This will later include construction of classrooms, office block, toilets and facilities for services to orphans at the school. The health component – which includes training in emergency services, provision of nursing and dental services and donation of a large number of items including an ambulance vehicle – will be implemented in partnership with the St. Joseph's Hospital and Roma College of Nursing. The programme also includes other sectors such as capacity building of the Police Fire Department and other entrepreneurial activities. A consignment of goods for donation to the previously identified institutions was dispatched from Ireland and is due to arrive in Lesotho this month. This endeavour will not only benefit the involved institutions, but will also raise the profile of Lesotho as a preferred tourist destination since the delegation will also make time to travel and explore the beautiful Mountain Kingdom during their stay. The Embassy is collaborating with the Ministry of Education and Training and the Ministry of Health and Social Welfare in Lesotho on this initiative.